Dylan Ho and Jeni Afuso are a husband-and-wife photography duo with a passion for storytelling—particularly within the culinary realm. They have shot for numerous cookbooks, as well as publications like Food & Wine, Travel & Leisure, and Saveur, capturing the people and places that make up global food and drink culture. 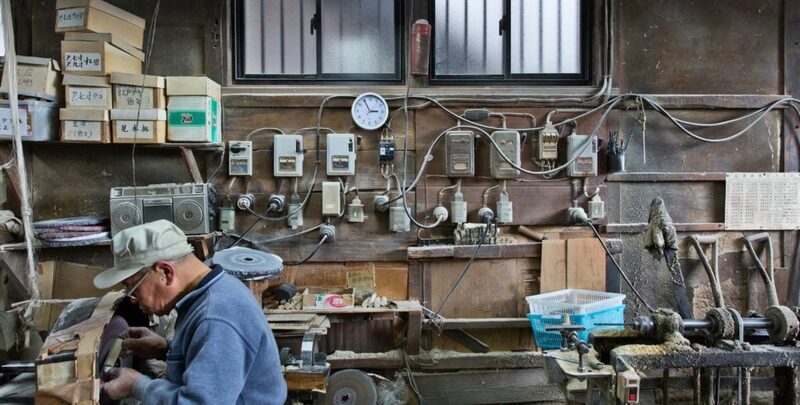 As part of a passion project, which began a few years ago, Dylan and Jeni have returned to Japan several times to create a series of photo essays on the country’s craftsmen. They were inspired by the dedication and artistry these makers exhibit within their individual pursuits, and Jeni, as a Japanese-American, who lived in Sakai City for two years was eager to showcase this through her lens. This past December, we met up with Dylan and Jeni outside of Osaka, to introduce them to one of the knife craftsmen we most admire: Itsuo Doi. 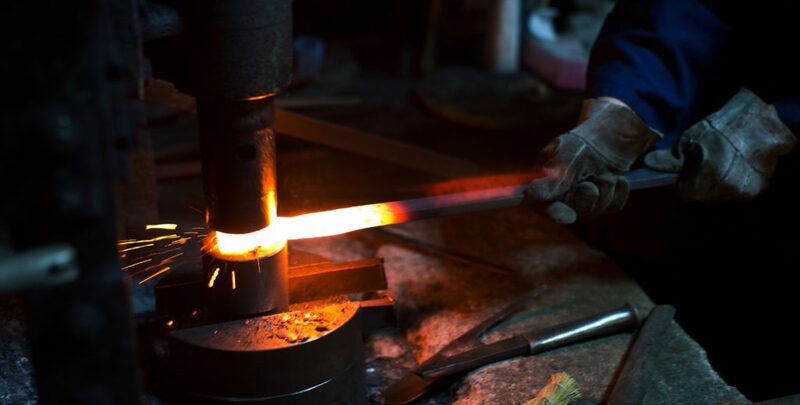 His workshop is located in Sakai City, an area that has been the heart of Japanese knife crafting, beginning with samurai swords in 14th century and transitioning to kitchen knives when sword making was outlawed in the 1860s. Sakai has become a bustling city in and of itself, with residences intermingled among several knife workshops. It is here that you’ll find one of the most well known knife making families in Japan. 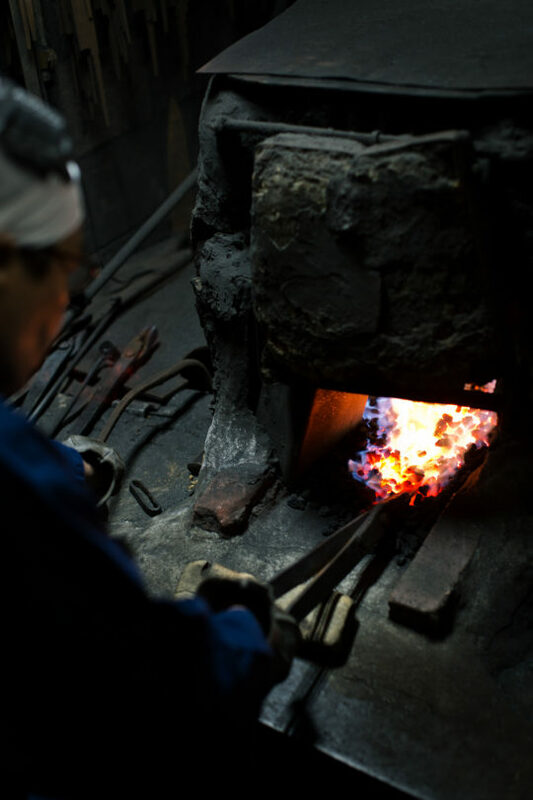 The business is run by Itsuo Doi, son of legendary blacksmith Keijiro Doi. 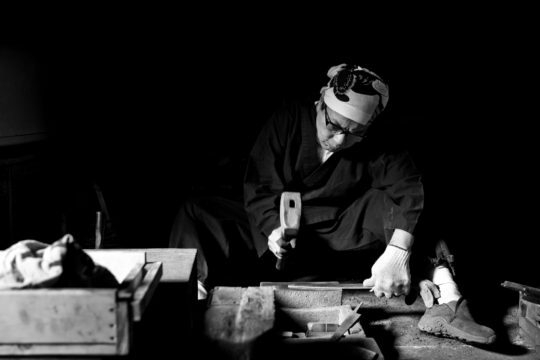 Keijiro Doi is among Japan’s most celebrated blacksmiths, having recently retired, at age 85. He has won several awards for his craft and is considered by many a living national treasure of Japan. Itsuo Doi started apprenticing with his father at age 24 and has now been practicing as a blacksmith for more than 40 years. In Japan, knife craftsmanship is a trade as well as an art form—a blacksmith might spend a lifetime perfecting just one skill involving in the making of a blade, and apprentices are not considered proficient until they have been working for at least 10 years. Traditional Japanese singled edged-knives are known for being task specific: the Western style versions are lighter and more balanced, while the single edge knives allow for more exact knife work. This precision is the result of not only the quality of Japanese steels but also the time-intensive process of heating, cooling, forging, and sharpening that each blade undergoes. 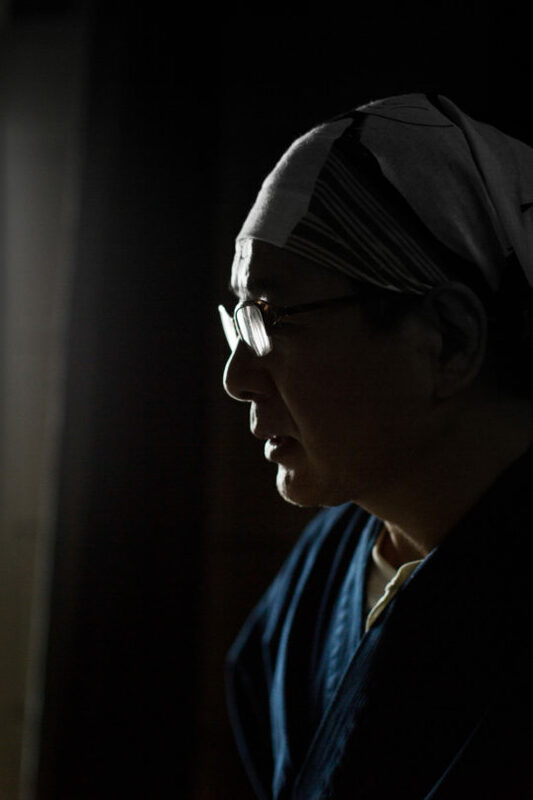 For Itsuo Doi, every step of the knife making process is done by eye and by hand. There is very little technology involved in the procedure; knives are made using the same tools that have been in the family for hundreds of years. 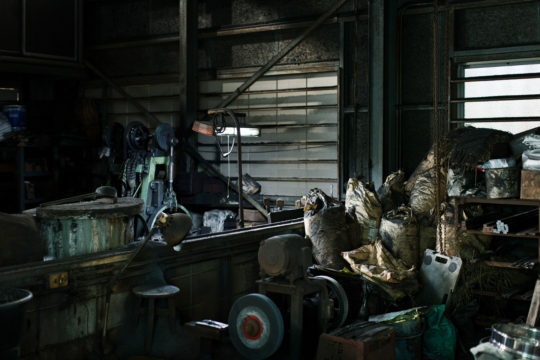 Stepping into the workshop feels almost counterintuitive to the hi-tech, futuristic factories for which Japan is so distinguished—the warehouse is dark, the tools are rusty, and the wooden walls are faded. And yet, the quality of the knives produced by the the Doi family is incomparable. We are honored to present this series depicting the Doi family’s extraordinary knifemaking process through Dylan and Jeni’s eyes. For its Takayuki Sakai knives, Doi-san uses Aogami 2 Blue steel, noted for its superior edge retention, toughness, and durability. 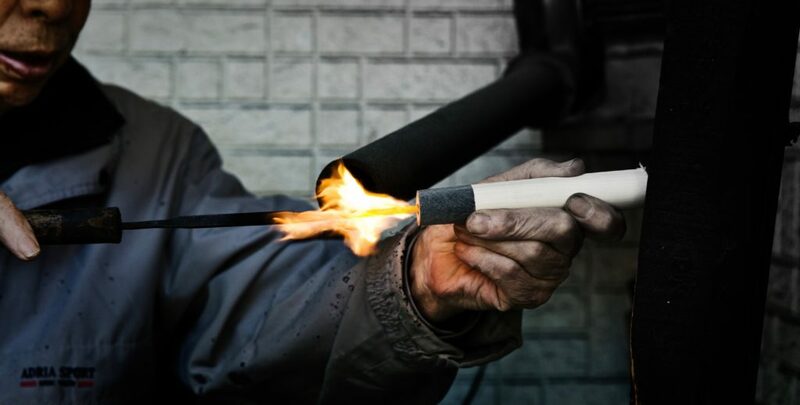 The process begins with the heating of the blade. 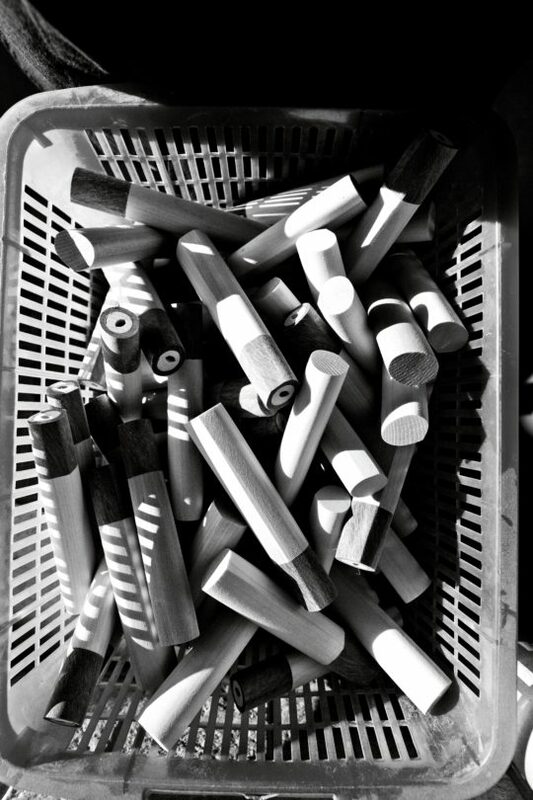 In order to do this, one must heat the charcoal to a very precise temperature—Itsuo Doi can determine this simply by looking at the color of the charcoal. 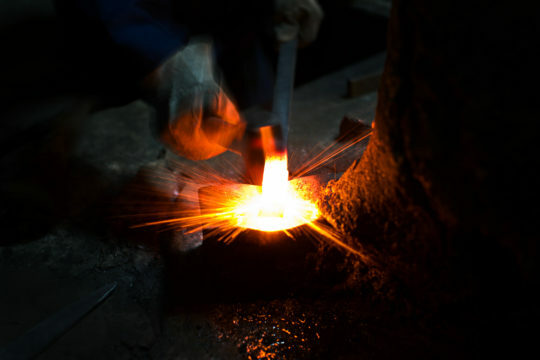 The blade is then heated over the fire, and forged into the exact shape that it needs to be. 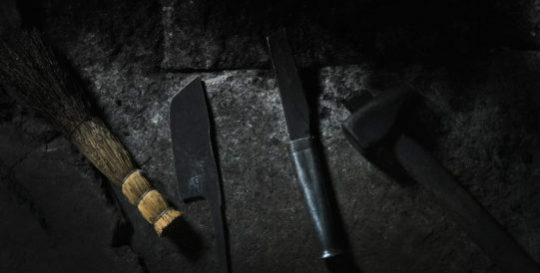 Doi-san does not possess any kind of mold or measurements for shaping the knives, but each comes out looking almost exactly identical to the one before. 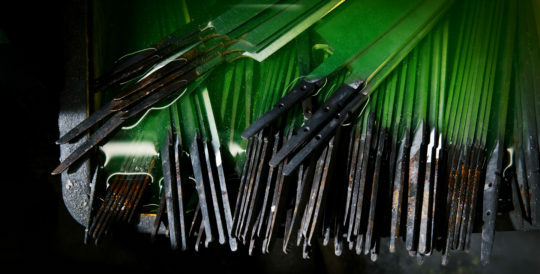 After each blade is forged and shaped, it is cooled, and then hammered again to strengthen and sharpen the blade. 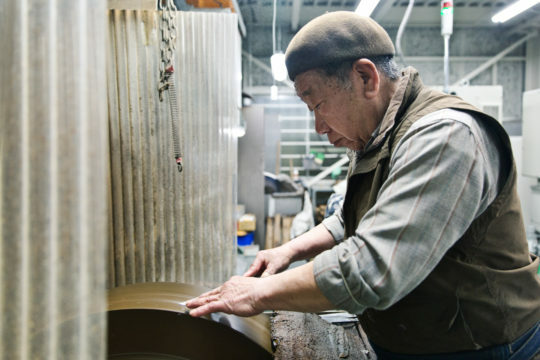 Even with Doi-san’s highly skilled hands, there are always blades that don’t meet his precise standards for knife making, and end up getting recycled—in fact, just a small percentage of the blades created in the warehouse end up becoming knives. Next comes the ‘Yaki’ phase, whose purpose is to harden the blade. 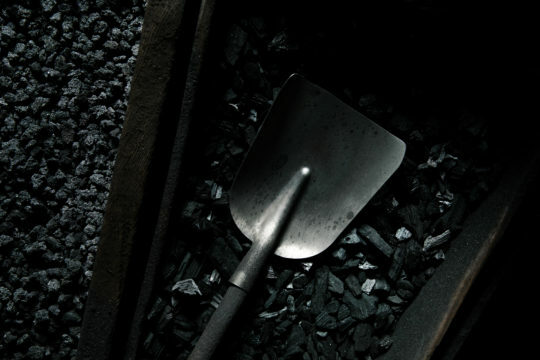 Once again, the process requires a very specific furnace temperature—720 degrees—which Doi-san can determine simply by looking at the color of the coals. The final parts of the knife making involve crafting the edge of the blade—an extremely delicate process done by hand on a series of natural fine grit sharpening stones—and finally, attaching the handle. Like most Japanese knife makers, Doi-san uses Japanese magnolia to craft the handles due to its sturdiness and resistance to water. Lastly, handles are fitted with a water buffalo horn and attached to the blade. To make even a single blade, this entire order of operations will take at least three or four days. Only about 12 knives are completed each day, making each one extremely special. In fact, the company name, “Chubo,” means “restaurant kitchen” in Japanese—an homage to the rigorous, high standards evident in the country’s sense of hospitality. 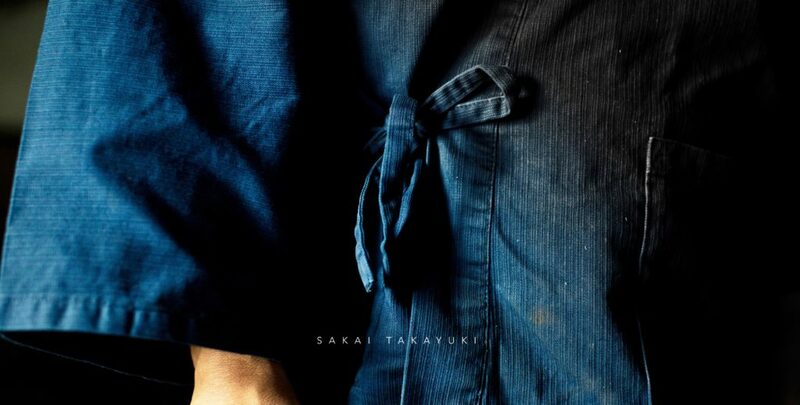 More of Dylan + Jeni’s photographs from Sakai Takayuki can found here.